Largest Instrumentation Valve Body Ever - Henry Williams Ltd. Excellent work from the team this month. Our largest instrumentation valve forging ever. Weighing in at 140kg we have produced 22 of these LF2 bodies which have been; forged, proof machined, heat treated at our sister company Con Mech Engineers Limited and tested in our UKAS accredited mechanical testing laboratory all this in 4 weeks. This represented a serious challenge and we are very pleased with how we have responded to meet the challenge laid down by our customer. 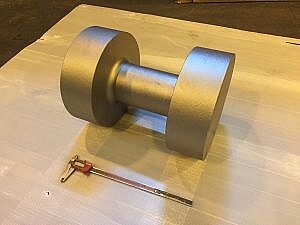 We have a range of double and single flange forgings available on short leadtimes. Manufactured from stock material (LF2, 316, F51 (M650), F55) through house dies which we can then tailor to your project to meet you and your customers specifications and certification. This can included destructive and non-destructive testing and 3.2 certification where necessary.